Twitter is probably the most public of your social networks and the most easily accessed. This transparency provides a huge number of benefits, but also means there are some Twitter mistakes that need to be avoided. First of all, a little known fact. When you mention / reply to someone, you often have their Twitter handle as the first text in the tweet right? I mean its logical, it defaults this way. There are accounts that are just pointless following back; that’s a truth. Though, aside from these spurious accounts you should follow everyone back. In most cases not following is a crime that should be punishable through death by 1,000 tweets. The notion of having more followers than people you follow is pointless and if the ratio is skewed substantially then you’re most likely missing out on something. The best thing to do is to follow those who interest you, inspire you and who give you value. This way you’ll end up with quite even numbers and it works itself out. Follow Friday’s should be value led and take into account the previous point made about using Twitter correctly. It’s quite common to see people just mention accounts on #FF in the hope of a follow, but for no other worthwhile reason. Picking one account a week and inform them why you consider them of worth is a far better way to act during #FF. Alternatively, mention your worthwhile followers from during the week. Both are a sure fire way to strengthen ties and do so in a sincere way. If you schedule a post and then decide not to follow up, it’s just plain stupidity. However, it’s something a lot of people tend to do. In the most part, scheduling is not really an issue; the follow up is the problem. Not being there to engage after your tweets is a bit of a waste of time, especially if you’re looking to build relationships and contacts. Simply, being there and being helpful makes all the difference. It establishes you as a go to person, helps build your community and allows you to establish individual relationships. The big thing about Twitter is developing personality. Creating something distinctive on Twitter is about sharing your personality. Use your image and name. If you own a business consider giving tweeting employees their own account – allowing you to personalise your business. However, don’t spend your time tweeting just your own stuff and continuously talking about yourself. Share your thoughts but share others too. Keeping a ratio of 70:30 (non promo – promo) is the best way to keep a decent balance. 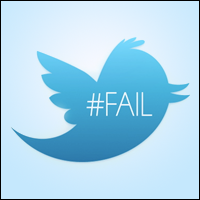 Twitter is not hard and for many of us it’s about trial and error. Hopefully with these tips there will be less error and more success from your efforts. Not enough? Still struggling and making Twitter mistakes? Get in touch with us for social media management services.